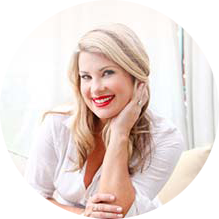 Hi and welcome to my Glam Farmhouse Halloween Porch tour! My husband and I just got back from our trip to New Hampshire and Vermont. And to say it was fun is an understatement! Click here to read my Fall in Vermont travel guide and see all the beautiful pictures. Of course I came back with an itch to add to my porch and really make it special for Halloween. And rather than do the traditional, I decided to shop the party store and try something different! I am always drawn to the vintage-inspired Halloween decorations. I picked up this cute countdown calendar at Homegoods and my kids love changing the days each morning. 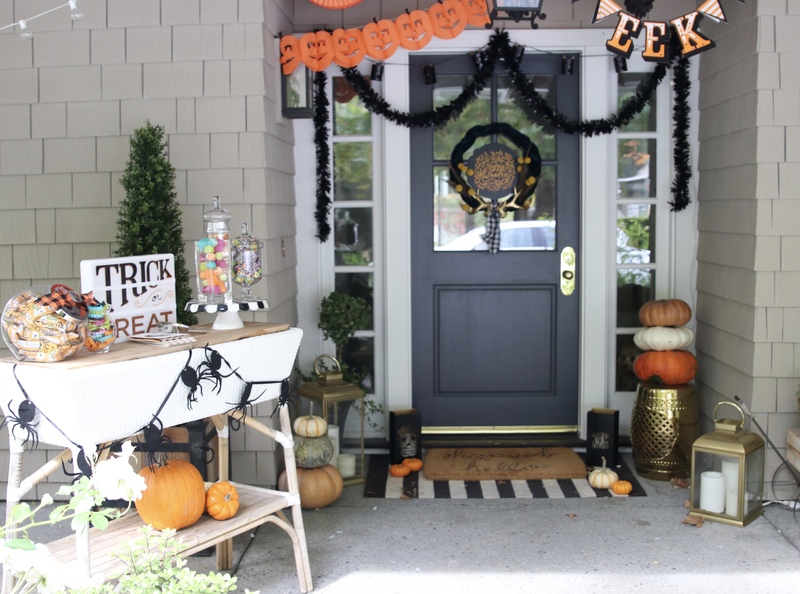 It was the perfect jumping off point to create this Farmhouse Halloween Porch. 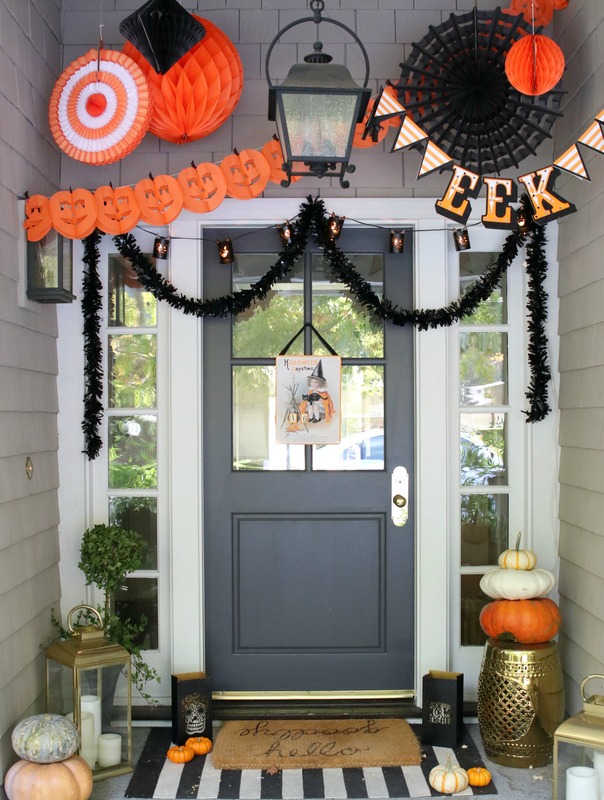 I found some fun party decorations at Target and our local party supply store and loved the simple, yet whimsical feel they added to my porch. 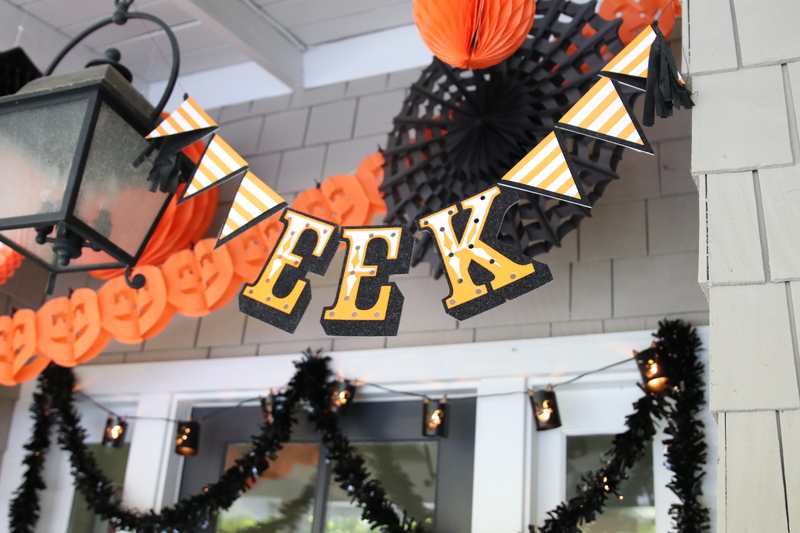 A few tissue fans and balls as well as this fun pumpkin garland were hung from the ceiling at varying depths. The giant web fan is my favorite! I layered in the EEK banner and some simple black tinsel to finish off the celebratory feel! Don’t you love decorating for the holidays? Now, these cute cat lanterns were my daughter, Charley’s favorite thing. To say she is cat obsessed is an understatement! 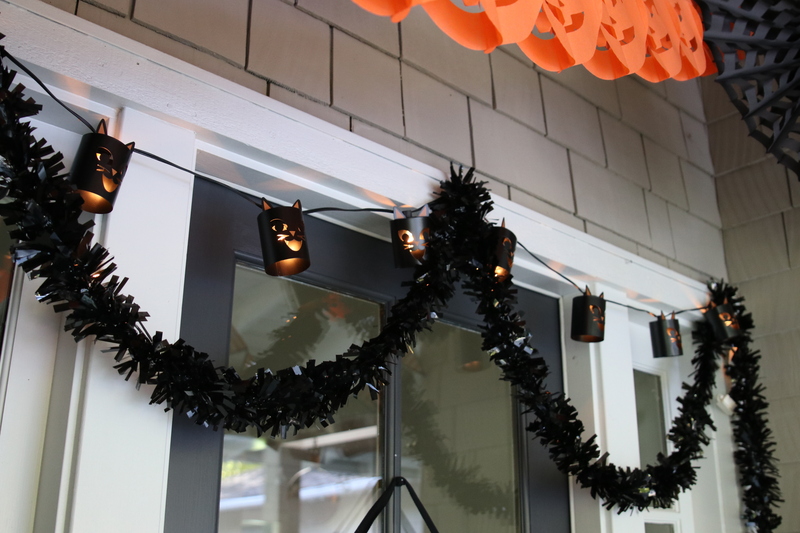 I featured these cute lanterns in my favorite Halloween Decorations post. They were a great find at Target for under $10 and they offer the most perfect and spooky light at night! We only get a few trick or treaters in our neighborhood. So I wanted to do something a little special this year. 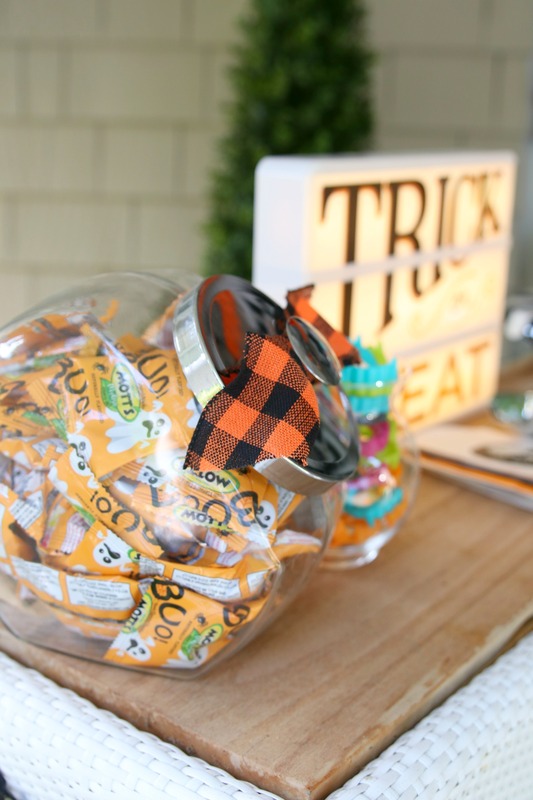 Rather than set out a bowl of candy, I created this fun Trick or Treat Candy Bar. 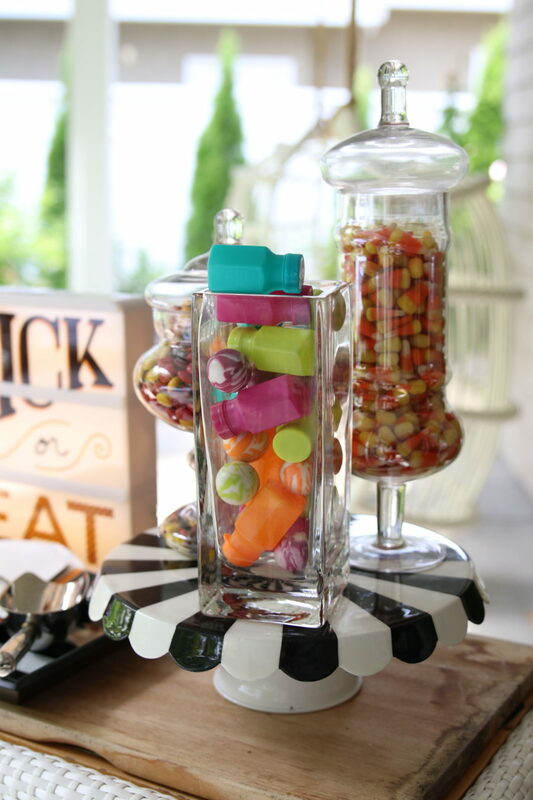 Utilizing my favorite Serena and Lily outdoor buffet, I added jars of candy and toys to the top. 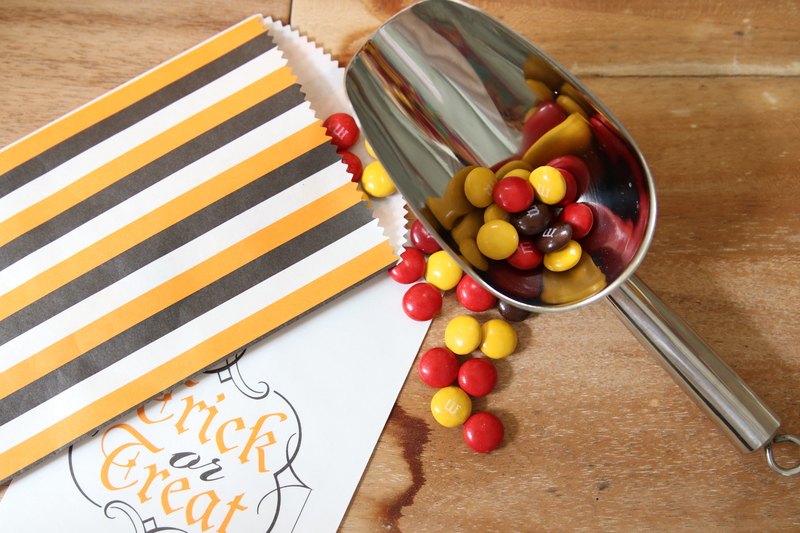 And cute candy bags encourage trick or treaters to fill up their bag with candy and toys of their picking! So, there you have it! 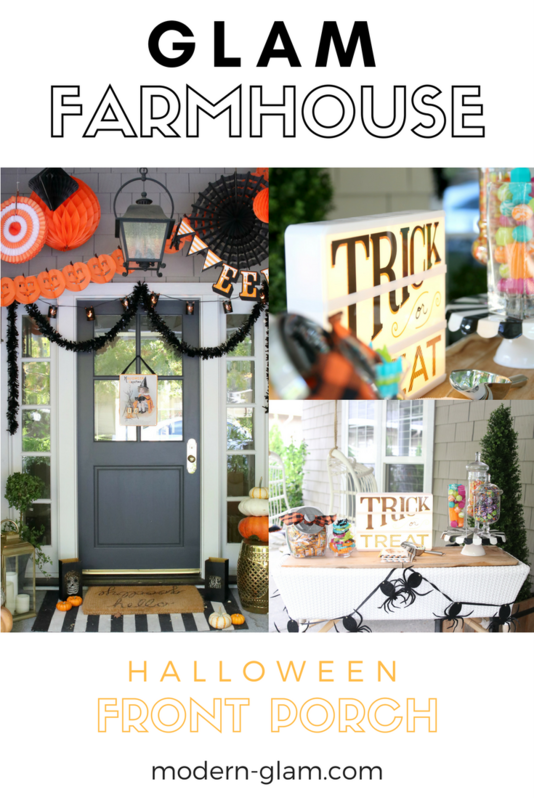 My fun and festive Farmhouse Halloween Front Porch. My kids love it, although it may be the candy they are after, lol! This is really Cute!!! i’M SURE YOU WILL BE THE MOST POPULAR HOUSE IN THE NEIGHBORHOOD! I love how you decorated your front porch so much, especially the cat lights and the little treat station is so much fun! Your front porch is so cute. I really love the black cat can swag and the eek swag. 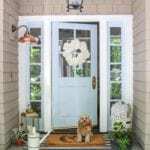 I was finished decorating my front porch but need to go check out the party store to see what I could add. Love it. Your front porch is outta this world amazing!! 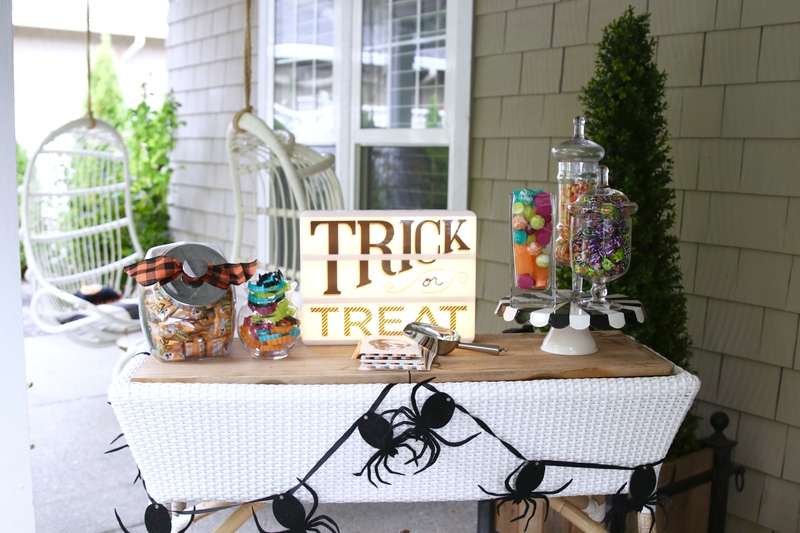 Love all of your Halloween touches and I bet your kiddies are eyeing off your Trick or Treat Bar!!! So cool! The cat garland is so cute!! Welcome home! I’m sure your trip to New England was fabulous! I’m happy that you were over the top inspired with your porch, it shows bigtime! What great decorations and I love that your daughter is obsessed with kitty cats!!! I want to trick or treat at your home! Candy please!!! I’m just love your Halloween porch! It has a vintage feel to it and I just adore vintage things. Happy Halloween! 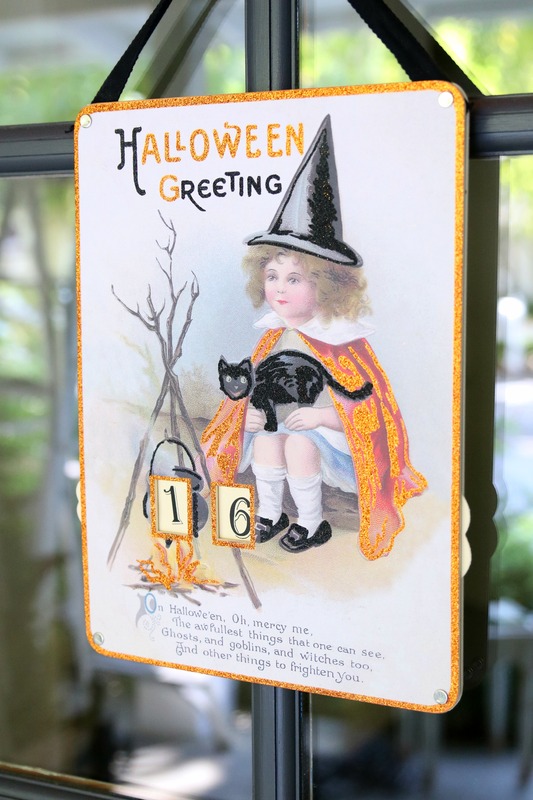 Your Halloween decor looks simply adorable! I love that sign with the little girl! Gosh, that is simply adorable! This set up should be featured in a magazine! You really did an amazing job! I loved your post! 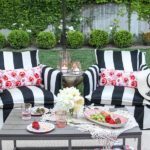 Your front porch will be a hit with kids! I am from nh! I’m glad you enjoyed your trip here. It is so beautiful at this time of year! Your porch looks awesome Ashley! I love the idea of the candy bar!!! 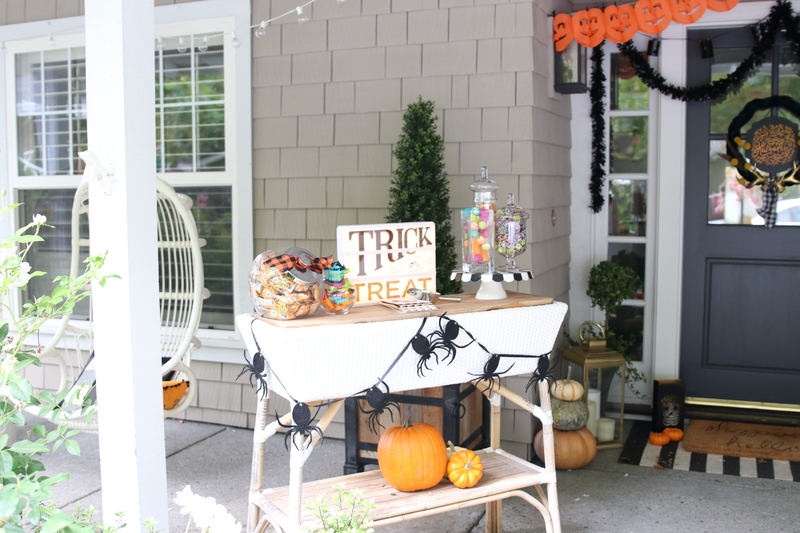 Ashley that is such a fun idea to have the candy outside for the kids. 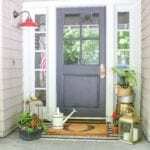 Your porch looks so welcoming for all the kids, and maybe avfew adults who are kids at heart. Thank you for sharing your darling porch. 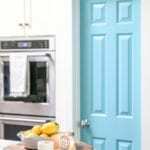 I love all the fun details and can only imagine the excitement children will have when coming for a visit. This was such a fun halloween hop!